to leave the ice front at its most retreated position ever recorded. 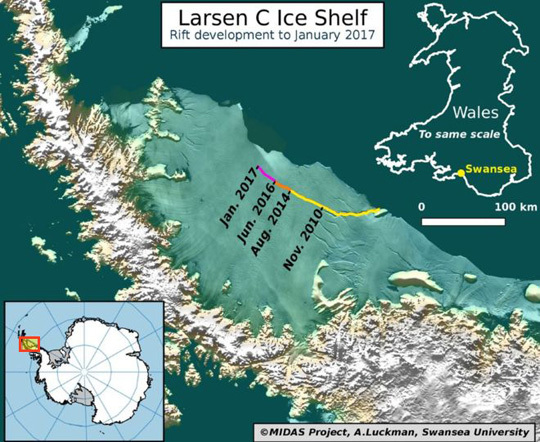 The current location of the 2,000 square mile ice shelf nearly the size of Delaware is marked off by the yellow, orange and fuschia date lines show the growing rift on the Antarctic Peninsula's Larsen C ice shelf. The crack has grown dramatically since 2011 by some 50 miles and has widened to more than 1,000 feet now. Illustration by the U. K. MIDAS Project in Swansea and Aberysthwyth Universities, Wales.